SHIPPENSBURG - Will Greene went into Saturday expecting to run the last race of his high school career at the District 3 Class AA track and field championships. 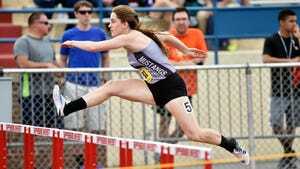 The Delone Catholic senior entered the 1,600-meter as the fifth seed but finished third with a state qualifying time. The Delone Catholic senior thought he had blown his best chance to make the state championships when he finished fourth in the 3,200-meter run Friday. And as the fifth seed in Saturday's 1,600-meter race, Greene was more focused on enjoying the run than winning. But by the time he had crossed the finish line in the 1,600, Greene had guaranteed himself a spot at the PIAA championships by placing third in a career-best 4 minutes, 29.37 seconds. The state qualifying time in the 1,600-meter is 4:31:13. When he crossed the finish line, he would say later, he "just about burst into tears from pure joy." As he waited to accept his medal, Greene couldn't stop smiling and shaking his head in disbelief. "Honestly, after last night I was pretty beat and I needed to tell myself this was my last race," Greene said. "Instead of telling myself I needed to run fast. I just said a quick prayer, and just said, 'I’m going to enjoy this.' This has probably been my most relaxed race all year, maybe of my career. I reached in and told myself all or nothing." Greene had never run faster than 4:35 in the 1,600-meter, and he didn't realize how fast he was going until he saw the clock about 10 meters before the finish. The senior isn't particularly nervous about running next week, after having thought he had already run the last race of his career. Fisher Taylor wasn't focused on rankings or where he would place on Saturday. The Biglerville junior knew he was seeded third in the triple jump, but he was more concerned with achieving a personal record than he was with beating his opponents. Taylor would end up doing both, finishing second in the event with a mark of 43 feet, .5 inches, which topped his previous best of 42-10. He advanced to the state meet for the first time. Taylor's goal at the beginning of the season was to break 42 feet, but he accomplished that by midseason and started focusing on reaching 43. That meant spending the spring lifting weights and focusing on his technique. While he originally joined the track team to stay in shape for soccer season, Taylor said the triple jump has become his favorite thing to compete in. “It’s so surreal, my goal this season was 42, so I guess 43 was just icing on top of the cake," Taylor said. "I’m ready for it. Triple jump is my favorite thing I do, so I’m glad I get to continue at the state level." Cierra Phillips didn't have time to feel happy or disappointed. The Fairfield sophomore had just finished second in the pole vault with a mark of 10-6. While she had reached her goal of qualifying for states, Phillips didn't clear the bar at 11 feet, the mark she had been striving for. But before she could react to the results, Phillips had to hurry from the indoor stadium where the pole vault was being held back to the track to run the 100-meter dash. She would pick up another medal by finishing fifth in that event with a time of 13.13 seconds. "I sprinted in my spikes down (to the track) because they needed me," Phillips said. "They were calling (up to the stadium) to make sure I wasn't late. "I'm really happy I made states, even though I didn't PR today, I know I can PR at states." Phillips' teammate Hannah Logue also qualified for the PIAA championships, taking second in the 400 meters with a time of 1:00.64. The Fairfield junior got off to a fast start and led early but was eventually passed by Sophie Goad of Schuylkill Valley. While she entered the race as the top seed, Logue said she was completely satisfied taking second since she still reached states. She also picked up a fourth-place medal in the 200-meter dash. "I knew (my time and Goad's time) were really close, so I was hoping for top-two and I'm really happy with how I ran today," Logue said. "It's really exciting, feels like all the hard work is paying off." 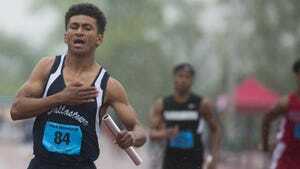 When Tavian Dorsey woke up Saturday morning and saw that it was raining, he immediately had a bad feeling about his events in the 100- and 200-meter dashes. As it turned out, Dorsey finished in the top three in both events and qualified for states in the 100 by finishing second with a time of 11.35 seconds. But as the top seed in that event, the Delone Catholic senior couldn't help but feel disappointed. "I woke up and saw rain, and I knew it was going to be a rough day," Dorsey said. "I think this is my first time running in the rain like this, where it was this cold, too. But I struggled today. It is what it is. 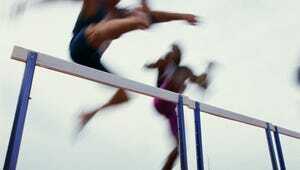 I'm just glad I finished second, and I'm going to states." Dorsey entered the 100 with plenty of confidence after finishing first in semifinals on Friday. But he had a late start coming off the block on Saturday and had to catch up just to get second. Although he was determined to qualify for states in the 200 as well, Dorsey was satisfied with his time of 23.18 seconds. He entered the weekend seeded fourth in that event. On the bright side, Dorsey said not winning the 100 has already provided him with plenty of motivation to get on the medal stand at the state championships. "It could rain next week, so I'm going to have to prepare for that and keep working on my starts," Dorsey said. "I have to practice as hard as I can because I know the competition is going to be twice as hard." Fairfield senior Morgan Jarrell felt right at home at Shippensburg University, where she plans to throw for the Raiders next season. She won the shot put with a personal-best throw of 35-2. Jarrell bounced back from a disappointing finish at last week's YAIAA championships. “I’m more comfortable here," Jarrell said. "I’ve been here a lot and always done well here, so it’s like my go-to place. I’m always excited to come here, I love the setup and I’m just comfortable. Zach Miller contributed to this report.